William Bagnall appeared in this photograph, mentioned in an article in the Wakefield Express in February 1979. He would have been around 30 years old. The photograph was taken at the consecration of the Bishop Walsham Howe Memorial. 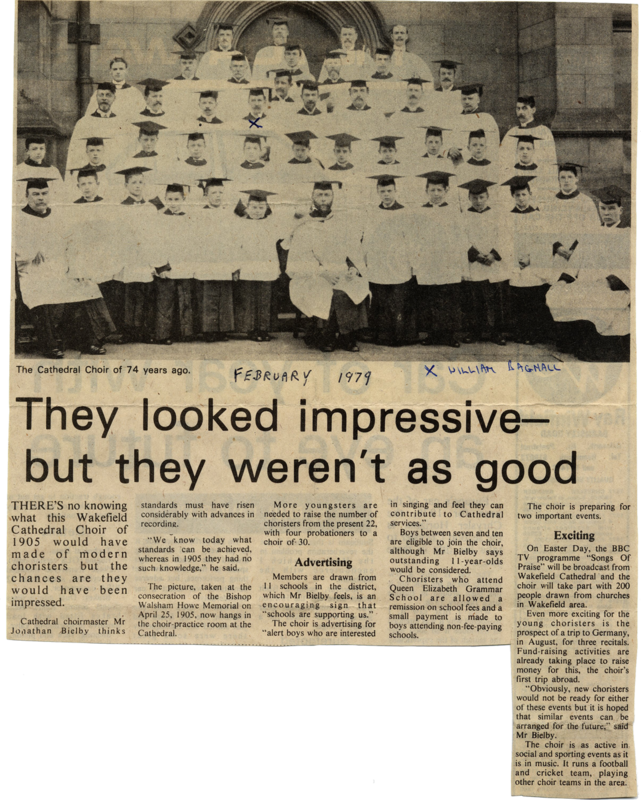 This article led Pamela & Dennis Brockbank and I to the cathedral and we were very kindly allowed into the practice room to look for the photograph where we were lucky enough to find it. THERE'S no knowing what this Wakefield Cathedral Choir of 1905 would have made of modern Choristers but the chances are they would have been impressed. Cathedral choirmaster Mr. Jonathan Bielby thinks standards must have risen considerably with advances in, recording. "We know today what standards can be achieved, whereas in 1905 they had no such, knowledge," he said. The picture taken at the consecration of the Bishop Walsham Howe Memorial on April 25, 1905, now hangs in the choir-practice room at the Cathedral. Members are drawn from 1l schools in the district, which Mr. Bielby feels is an encouraging sign that "schools are supporting us." The choir is advertising for "alert boys who are interested in singing and feel they can contribute to Cathedral services." Boys between seven and ten are eligible to Join the choir, although Mr. Bielby says outstanding 1l-ycar-olds would be considered. Choristers who attend Queen Elizabeth Grammar School are allowed a remission on school fees and a small payment is made to boys attending non-fee-paying schools. The choir is preparing for two important events. On Easter Day the BBC TV programme "Songs Of Praise" will be broadcast from Wakefield Cathedral and the choir will take part with 200 people drawn from churches in Wakefield area. Even more exciting for the young choristers is the prospect of a trip to Germany, in August, for three recitals. Fund raising activities are already taking place to raise money for this, the choir's first trip abroad. "Obviously, new choristers would not be ready for either of these events but It is hoped, that similar events can be arranged for the future." Said Mr. Bielby. The choir is as active in social and sporting events as it is in music. It runs a football and cricket team, playing other choir teams in the area.